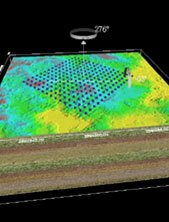 MicroRAD® is a part of Terrascience's microseismic monitoring line of products. This equipment builds upon the experience gained in the design and deployment of Terrascience Systems’ structural monitoring equipment for oil and gas platforms and marine vessels over the last 35 years. The MicroRAD® software package is designed to be a versatile piece of software allowing multifaceted analysis of seismic data. Facilities are available for determining source location, source parameters, sensor calibration, trend tracking, and displaying events in both graphical and 3-dimensional views and time-lapse format. Sensor calibration is accomplished by firing one or more shots at known locations and recording the ensuing events. The captured events are then hodogram-analyzed to determine actual sensor orientation. These values are then used in computation of source location to ensure that they are accurate. As new events are entered into the data base, they are automatically analyzed for source parameters such as location and magnitude. The events parameters, combined with statistical information, are used to generate periodic reports for a specific site. The reports can be delivered to the stakeholders through regular e-mail. The source parameters can be used for plotting the event in a 3-dimensional display. This display can be manipulated in 3-dimensions by panning, rotating, and zooming. Multiple events within a certain time frame can be plotted on the same display as a time-lapse image of a developing situation. From this 3-dimensional display, a specific event can be selected for more detailed source parameter information and further analysis. The user has an option of manual, on-the-fly, or batch data processing. Microseismic analysis software can be configured to allow multiple user access to the data base to carry out data analysis.